UPDATE, FEB. 1, 3:00 P.M.: Making good on their promise, Sodexo workers at Fountain Valley Regional Hospital & Medical Center walked off the job for a one-day strike. 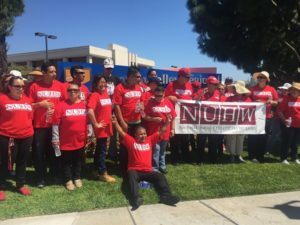 The National Union of Healthcare Workers (NUHW) is representing the housekeeping and cafeteria staff in efforts to win a first-ever contract with the subcontracted multinational corporation that guarantees better wages and benefits. Most entrances at the hospital had “neutral gate” signs up that tried to railroad Sodexo workers, their suppliers and visitors elsewhere. But dozens of workers turned out for a 12-hour public picket that peaked with a noontime rally. Speakers took turns at the bullhorn challenging the corporation to up their poverty pay. “I’ve been working for Sodexo for eight years,” said Maria Roman, a crowd favorite. She mentioned getting a raise last week, but only from $10.98 to $11 an hour. “More!” the crowd cheered. “We stick together for a fair contract for us, our families and our patients. We will do whatever it takes!” Prior to the strike, the union put out a video showing workers collecting and recycling cans after clocking out in an attempt to make ends meet. NUHW hopes to secure an agreement to boost hourly wages by almost three dollars. Sodexo workers had no shortage of support from elected officials and candidates on the picket line. 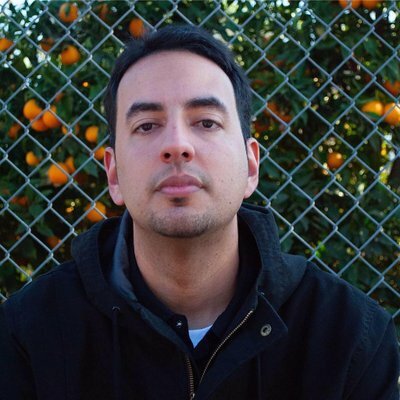 “All we’re asking for is a living wage,” said Santa Ana councilman Jose Solorio. “We’re asking for a company that’s doing very well financially to share some of it with its workers. I’m going to keep coming back until we have a fair and just contract.” Westminster councilman Sergio Contreras and Anaheim mayoral hopeful Ashleigh Aitken joined in support of the cause. And then there were the numerous congressional candidates trying to unseat Republicans in hopes for a “Blue Wave” in November like Andy Thorburn, Phil Janowicz and Hans Keirstead. Union president Sal Roselli connected national politics with the local labor struggle by blasting Tenent Healthcare, which owns Fountain Valley Regional, and Sodexo for standing to reap enormous gains from the Trump tax cuts without raising wages for its lowest-paid workers. “We’re giving Tenet two choices,” he said. “Either fire Sodexo and bring everyone in-house or give Sodexo enough money to pay the same wages and benefits that everyone else makes.” The labor leader also gave striking workers hope by noting the fact that USC fired Sodexo just a few weeks ago and brought all hospital workers in-house. “If you take one of us on, you take all of us on!” Roselli added. After union claps and chants of “Si, se puede,” workers grabbed a picket sign and started their picket anew. Where the labor dispute goes after the one-day strike ends remains to be seen. Negotiations between the workers’ union and Sodexo haven’t resulted in a contract with salary raises, prompting the strike vote. “I’d like for supervisors who make much more money than us to put themselves in our place trying to make a living on a minimum wage,” Armenta says. “We’re left with having to recycle cans to pay the bills.” The latter point became dramatized in a video NUHW put out before the strike vote. It showcases Fountain Valley Regional housekeepers, alongside their Los Alamitos and Lakewood Medical Center counterparts, collecting cans to make ends meet. 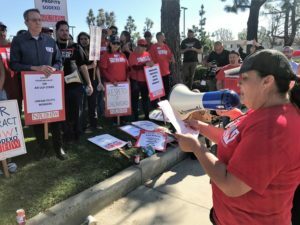 Alongside complaints about poverty wages and lack of affordable benefits, Sodexo workers at Fountain Valley Regional say staffing levels are kept low for the sake of profitability, not patients. Maria Villacaña, a housekeeper with nearly 20 years experience, can remember a time before Sodexo took over in 2011 when workloads were lessened by more workers on hand. “We had benefits, paid sick days and our health insurance was cheaper,” she says in Spanish. “It’s not fair that they’re making us work the job of two people, but wont hire more staff.” Armenta agrees; she cleans 18-20 rooms a day without help. The working conditions at Fountain Valley Regional under Sodexo pushed staff to finally join NUHW in November 2016. Villacaña spoke about the need for to unionize before the corporation began operating at the hospital but coworkers never followed all the way through with a campaign. But now, Villacaña says management assails NUHW during meetings as liars hellbent on taking their money through union dues. “I told my coworkers, ‘Let’s strike!’ because Sodexo didn’t want to accept $14 or even $15 per hour raises,” she says. “Sodexo and NUHW are negotiating a first contract for Sodexo employees,” Katherine Lane, a spokeswoman for the hospital, writes the Weekly in an email. “The employees represented by NUHW are employed by Sodexo. We hope the contract is resolved quickly.” Sodexo hopes so, too. “We’re disappointed that the union has called for a strike in the midst of ongoing collective bargaining and we hope that our employees will not strike as we work with the union to establish a new agreement,” writes Enrico Dinges, Sodexo’s public relations director.